We care about your needs. If you have questions regarding which of our services to choose, please feel free to email or call us. We would be happy to spend a few minutes helping you to determine which nutrition and/or testing package would be ideal for your health and performance goals. 24-hour cancellation policy: we politely request athletes contact their eNRG Performance Sport Dietitian at least 24 hours in advance to cancel appointments. If appointments are cancelled less than 24 hours beforehand, the scheduled consultation will be billed. Shortly after Bob Seebohar created the concept of Metabolic Efficiency Training™ in 2003, he knew he wanted to find a way to measure it. 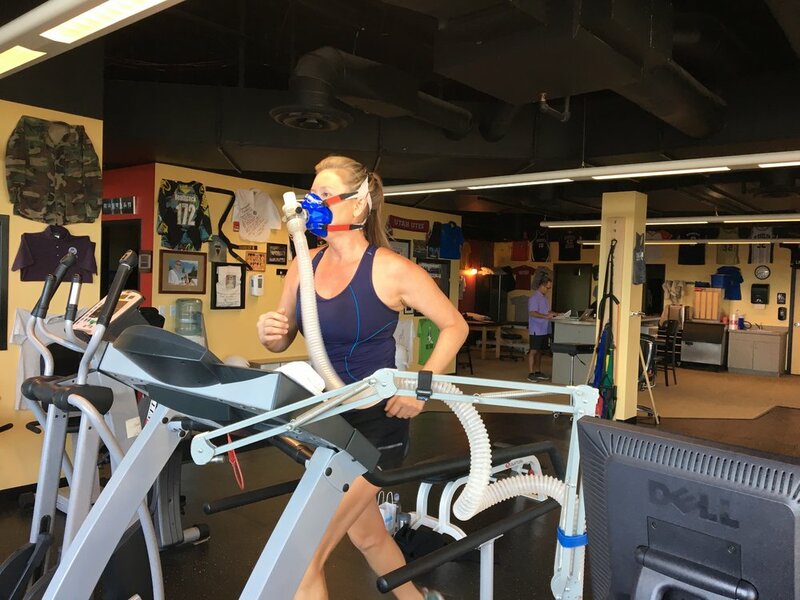 Firmly believing in the fact that if you don't measure, you can't improve, Bob put his exercise physiologist hat on to determine if he could configure a test that would indeed measure the body's ability to enhance fat oxidation and carbohydrate preservation. In a short amount of time, he created the testing protocol which can validate if an athlete's nutrition program is meeting their goals. Metabolic Efficiency testing is a sub-maximal nutrition assessment that can validate if your daily nutrition plan is supporting your body's ability to burn more fat and at the same time, preserve its precious carbohydrate stores. Most people only have enough carbohydrates stored in their body to last about 2 hours of moderate intense exercise. Contrast that to having hours upon hours of exercise while using your almost unlimited fat stores and you can see why we want to improve the body's ability to use fat as energy while preserving the precious carbohydrate stores. This helps both health and performance markers. And yes, contrary to popular belief, you can burn fat at higher intensities. In fact, we have measured an endurance athlete who used a large portion of fat (61%) at 87% of his VO2peak. It is possible! Along with identifying if and when your body crosses from using more fat to carbohydrates, termed your Metabolic Efficiency Point (MEP), Bob has also identified important physiological variables that will help you further understand your body and its "nutritional fitness". 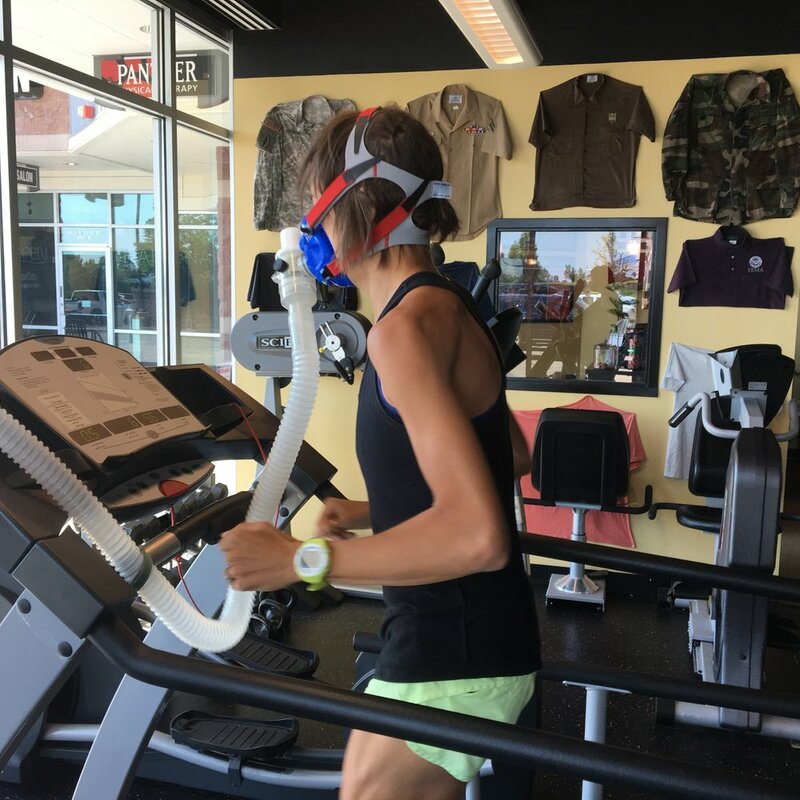 With the eNRG Performance Metabolic Efficiency testing, you will not only learn if you have a MEP but also at what intensities (heart rate, power, pace, RPE). This crucial information helps our trained Sport Dietitians to customize a daily and training nutrition plan that is right for your unique fitness level, gender, and physiology. There are no generic recommendations. We personalize all of your nutrition plans based on the findings from the test and we mold it into your lifestyle to make it simple and sustainable. No guessing. No wondering. No mistakes. As we like to say, "Test. Don't guess." Resting data including metabolic rate, heart rate, percent carbohydrate and fat oxidation. This helps us understand your overall health to uncover health status better. Metabolic Efficiency Point. Some individuals have it, some don't. This is why we like to measure. Remember, "Test. Don't guess." 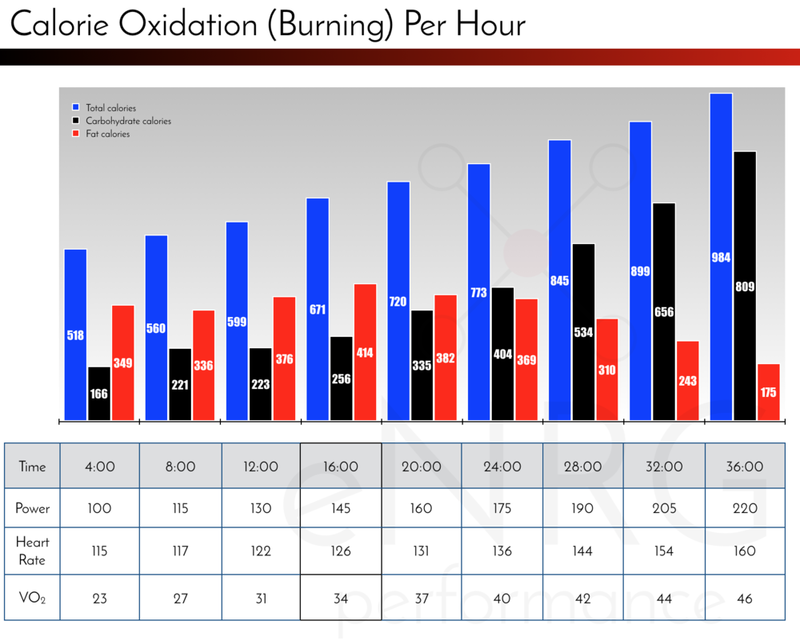 Amount of carbohydrate and fat calories and grams you burn at various intensity levels per hour of exercise. The intensity is measured by speed, heart rate, pace/power, and rating of perceived exertion. Amount of carbohydrate and fat grams you burn at various intensity levels per minute of exercise. Total mount of total calories your body burns at each intensity level. Calorie Efficiency Ratio. This is a ratio in which Bob Seebohar created that provides you an accurate range of calories to consume during exercise based on your current fitness level, gender, and physiology, as opposed to research recommendations which are cookie cutter in nature and do not account for gender differences. Fully customized daily and training nutrition plan from a Board Certified Specialist in Sports Dietetics (that's the best of the best in Sport Dietetics) that will improve your Metabolic Efficiency health and performance. Below are a few deliverables that we provide you from the testing. We provide you quite an extensive Interpretation Packet that will explain all of the variables we measure during the test and more importantly, how to use these in your daily life. The below deliverables are a snapshot of the data we provide you and will give you an idea of the customized approach we follow when it comes to taking extremely complex data from your test and making it friendly and easy to interpret. This is the Metabolic Efficiency Point graph that will show if and where your MEP happens. It is unique to each person and your daily nutrition will account for roughly 75% of your body's ability to use fat and carbohydrate. Your MEP can change in as little as a few weeks when your nutrition plan is correct. This shows how many total calories you burn per intensity stage per hour and more importantly, where those calories are coming from. It is important for us to know not only total calories burned but also how many of these come from carbohydrate and fat. This graph is the brainchild of Bob Seebohar. After years of gathering data from athletes, he finally determined the proper ratio of calories that individuals should eat per hour based on their unique physiology and gender. The hourly calorie range will change based on your level of metabolic efficiency. You will visit us in a fasted state and prepare for both a resting and a sub-maximal exercise test. The resting measurement lasts 10 - 15 minutes and the exercise test usually lasts 20 - 45 minutes (depending on your level of "metabolic fitness") but your appointment is scheduled for 1.5 - 2 hours. We like to spend quality time with you after your test to make sure you have full understanding of your results and the nutrition plan that we construct for you. After the test, we will sit and explain the results, interpret the data and formulate a daily nutrition and nutrient timing plan based on your individual data and your health and performance goals. To learn more about Metabolic Efficiency Training, we encourage you to visit the Metabolic Efficiency Training website. Why do we offer packages while others just offer one test options? It's simple really. We are Registered/Sport Dietitians trained in behavior modification strategies and we care about improving both your health and performance. We take a look at your test results then use the data and combine it with your specific lifestyle to ensure that all parts of your personal nutrition puzzle are taken into consideration to ensure your greatest opportunity for success long-term. We take the time to sit down with you after testing to discuss how to best utilize the results. We are the best of the best. 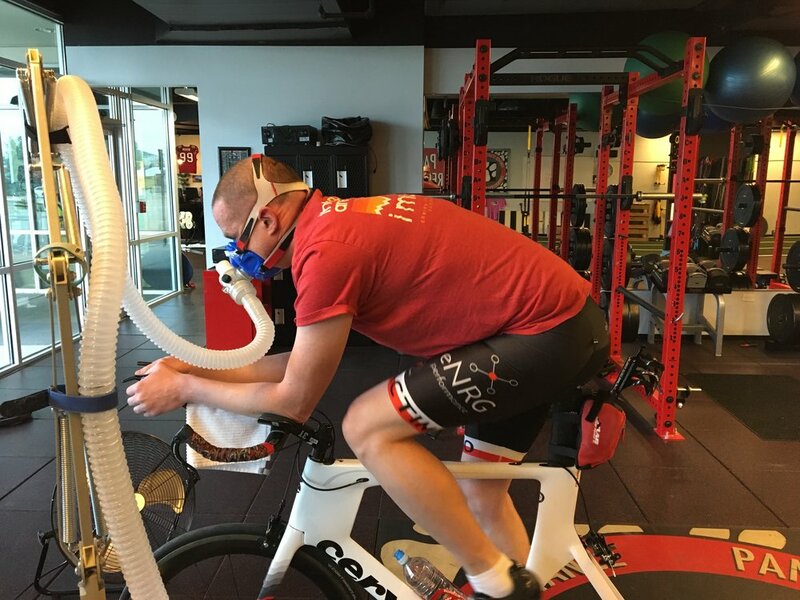 This is a great way for you to get the benefit of a pre- and post Metabolic Efficiency test but without the frequent communication with an eNRG Performance Sport Dietitian. This is offered as a treadmill or bike test or for triathletes a bike to run test in the same appointment. Read more about this package. This is the basic eNRG Performance package that is designed to help determine your baseline Metabolic Efficiency and make significant strides to improve your health and metabolic performance. This 3-month program is designed as a pre-test/post-test with frequent communication in between. Your eNRG Performance Sport Dietitian will customize your plan to enhance your daily and training nutrition through continual communication throughout the three months. This is offered as a treadmill or bike test or for triathletes a bike to run test in the same appointment. Read more about this package. This is the power package of testing and will provide you the most bang for your buck in terms of turning your body into a fat burning machine and successfully adopting a lifelong nutrition plan through success behavior change. Your eNRG Performance Sport Dietitian will be your personal guide in this journey and will leave no stone unturned to improve your health and performance. This is offered as a treadmill or bike test or for triathletes a bike to run test in the same appointment. Read more about this package. Have a competition coming up and need to know the exact calories you should eat per hour during your event? This is the perfect option for you. Test, don't guess! Read more about this test. We understand that you may not be able to visit us in beautiful Colorado but you would still like our expertise in interpreting the data you received from another institution who measured your Metabolic Efficiency. This service includes a comprehensive interpretation where you provide us the raw data of a Metabolic Efficiency test. We do offer single Metabolic Efficiency Tests but do not normally recommend them since we cannot quantify how well our nutrition plan that we give you after the first test works. However, if you would like to schedule a one-time test, purchase it below and we will contact you to schedule it. Testing will be done on a treadmill or if you prefer a bike test, you will bring your own bike to ride on our bike trainer.